An optical sensor enables automatic consecutive detection of crop marks throughout the nested image which the Inkjet printer prints, in combination with the automatic adjustment function to obtain precise contour cutting. By continuously detecting a maximum of 4 points, nested images in both X axis and Y axis can be cut aligning each image automatically. With the original half cut function, the backing sheet can be cut leaving a little bit of half cut connecting points,which can be easily detached when necessary.Various media without backing sheets can be also cut. 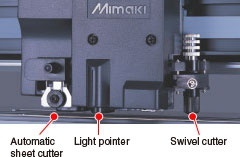 Media is automatically cut by a standard sheet cutter. All trademarks or registered trademarks are the property of the respective owners. Specifications are subject to change without notice.